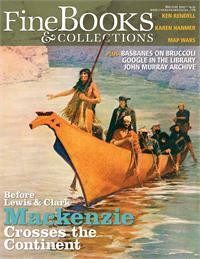 By Derek Hayes — Before Lewis and Clark, Mackenzie crossed the continent. By Steve Hare — The most important archive sold in a century heads for Scotland. Sandy Island library, Ken Rendell collects [READ ONLINE], Taiwan’s antiquarian book writer, Books and Culture [READ ONLINE], and more.